I made this following Palash’s instructions. It was so good! When I started writing my blog, I’d already been cooking Indian food for about 18 years. Like many of you, I got through my share of cookbooks and made hundreds of recipes. I was quite good at cooking other people’s recipes but had very few of my own. It took starting a blog and knowing the basics before I actually began developing my own recipes. Developing my own recipes is one part of writing my blog that I enjoy most. That and learning new unique recipes and techniques from chefs that are taking Indian food to a new level. Nowadays, I still look at the odd new Indian cookbook, but I’ve found that most of the recipes are so close if not exactly like those I’ve already tried that I rarely bother to make them. Unfortunately most cookbook publishers seem to like to play it safe. That isn’t always the case. There are a few chef/authors out there I really admire for their creativity and ability to make old classics like tandoori chicken and take them up a notch. 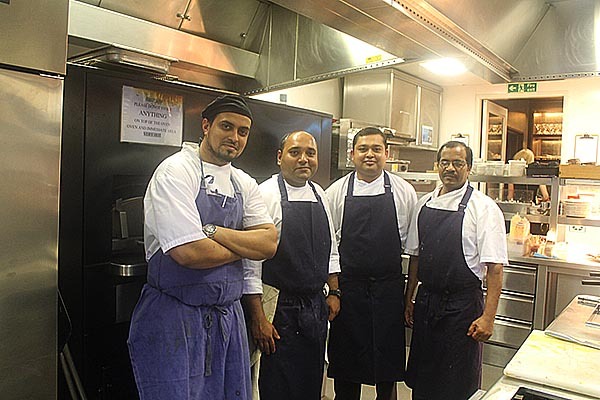 Palash Mitra is one of those chefs. He doesn’t have a cookbook yet but as Head Chef of Scarfes Bar at Rosewood London, I’m sure his day will come. 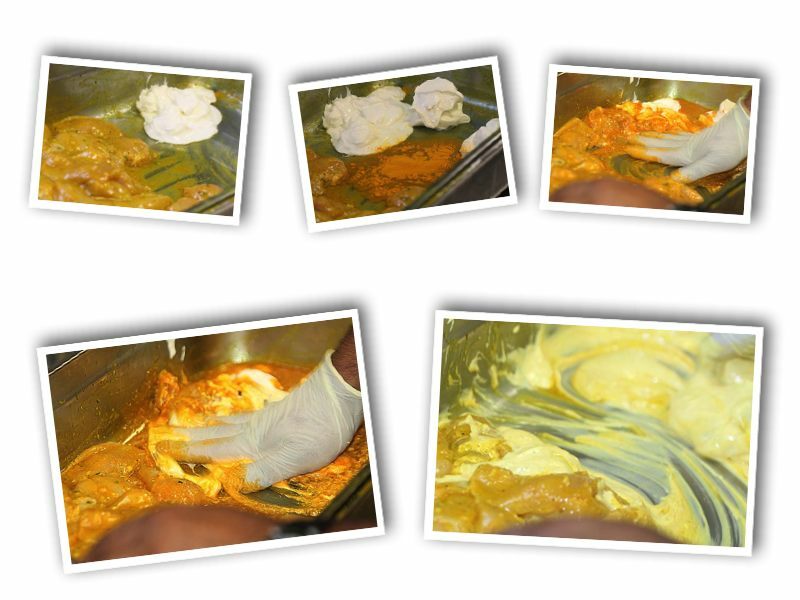 Following is Palash’s tandoori murgh malai recipe which I had the honour of watching him prepare during a recent visit to Scarfes Bar. Believe me… this is as good as it gets. Palash, who once worked under one of my all time food heroes Chef Vivek Singh took me through the recipe step by step. 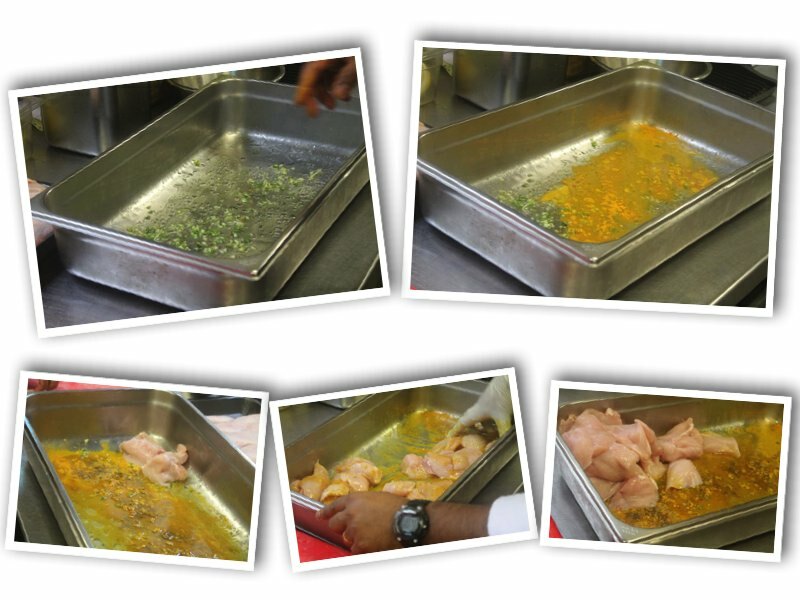 He mixed all of the ingredients by hand and then rubbed them into the chicken to marinate for 24 hours. After trying the tandoori chicken at Scarfes Bar, I knew I had to make it myself. I took home with me not only Palash’s recipe but a few preparation techniques which I will be applying to my own recipes. If you like this one as much as I think you will, be sure to try Palash’s tandoori prawns! Working the second marinade into a smooth emulsion. Pour the oil into a deep bowl and add the ginger-garlic paste, salt, turmeric, chopped green chillies, ginger, lemon juice and saffron. Add the chicken pieces and one half of the cream. Mix well and add the sandlewood powder if using. Rub this into the chicken to marinate while you prepare the second marinade. Heat the ghee over a low flame and add the royal cumin (black cumin) and let it splutter. Let this cool to room temperature. Pour this mixture over the chicken and then add the rest of the cream, the cream cheese, coriander and the yogurt. Allow to marinate for 24 hours. To cook the chicken, thread them onto skewers and grill over medium heat untill cooked through. Alternately bake in an oven at 180c for 6-8 minutes or until cooked through. 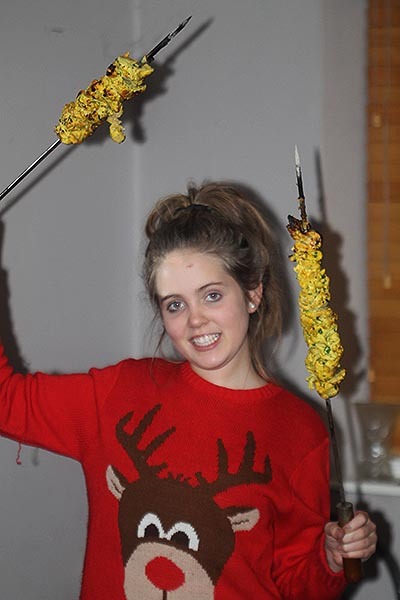 My daughter showing off two skewers of chicken she cooked in our tandoor. Please confirm if I have misread but are u suggesting that hot ghee and royal cumin mixture is poured over raw chicken and the is left for 24 before it is cooked. Isn’t there a risk of food poisoning ? Thank you for your question. To be honest, the ghee does cool quite quickly when it comes in contact with the cold chicken. I have never had a problem. That said, I have changed the recipe and suggested people allow the ghee to cool before adding. Good idea. Hey…can you tell me when to add the chopped ginger and garlic…there is already the ginger garlic paste mentioned in the first marinade but no mention of the chopped ginger and garlic elsewhere in the procedure. Sorry about that. Need to get it fixed. The garlic and ginger goes in after the oil. about two tablespoons garlic/ginger paste. I must try this. It will be me doing the cooking though. I am the curry fan in my house! Go for it Daniel! 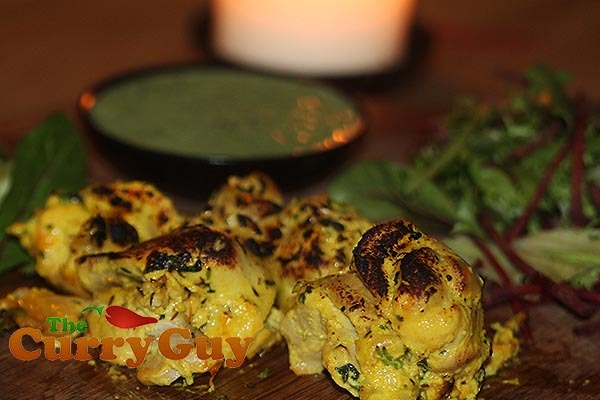 This is one of my favourite chicken tikka recipes.